The geometric shape is traditionally used to calculate phytoplankton cell measurements (e.g. biovolume), but it can also play an important role in determining community distributions. Little is known about how geometric shapes relate to other morphological traits or to the environment. We explored whether shapes and related morphological traits are selected by environmental forcing. For this, samples were collected seasonally at 21 stations in coastal-marine waters of the Salento Peninsula (Italy). Phytoplankton taxa were classified in terms of geometric shape, biovolume (organism size) and surface-to-volume ratio (S:V). The relationship between greatest axial linear dimension (GALD) and S:V was assessed for each shape. 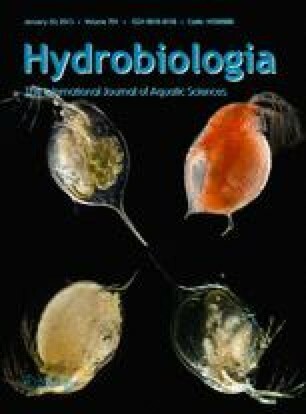 A Canonical Correspondence Analysis (CCA) was performed to evaluate phytoplankton shape distribution on temporal and spatial scales. Phytoplankton community was characterized by high morphological diversity. GALD and S:V were inversely related in most of the shapes. CCA showed that phytoplankton shape distribution was influenced more by seasonal than by spatial variation: elongated shapes characterized the cold period; rounded and combined shapes the warmer period. Most of the shapes showed conservatism of the S:V and trade-off with the size. Geometric shapes represent an interesting feature to be considered in trait-based approaches to study phytoplankton distributions in aquatic ecosystems. This study was funded by grants from the Italian Ministry of Instruction, University and Research (MIUR), Fondo per gli Investimenti della Ricerca di Base (FIRB), the EU and Puglia regional administration as part of the INTERREG II Italy–Greece project. We are grateful to A. Fiocca for phytoplankton analysis and C. Ianni and N. Ruggieri for water column chemical data. We thank George Metcalf for revising the English text. We acknowledge three anonymous reviewers whose comments and criticisms improved significantly this manuscript.